I'm making a concerted effort to focus on what's already been released in 2017, while continuing to try and make a dent in my backlog. I'm starting with a band that I've never properly listened to before. Of course, I'm aware of their place within the history of UK black metal, having been in existence for over twenty-five years. 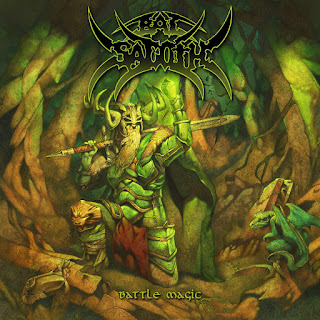 Currently on hold, their 1998 full-length 'Battle Magic' has been reissued and re-released by the returning Cacophonous Records, with new artwork by Fantasy artist Martin Hanford, which certainly looks the part. I haven’t dabbled in the fantasy/battle/symphonic metal realm for a long time now and while it’s wrong on me to describe Bal-Sagoth as any of those things, opener Battle Magic has a lot of in common with those sub-genres. Beyond the synths that provide the symphonic background to Naked Steel (The Warrior’s Sage), there’s also more than a hint of traditional heavy metal and when they do eventually come, the black metal growls stand out beyond the grandeur. Way before bands like Turisas and Alestorm had their day, bands were all the more serious and Bal-Sagoth’s catchiness seems to be there to catch you off guard. A Tale From The Deep Woods is a mix of both bouncing, up-beat orchestration and extreme metal that works because of the band’s conviction. Three songs into ‘Battle Magic’ and I’m not entirely sold on the formula, but I’m not one to be dismissive because of that. The guitar work is definitely something to be admired on here and it works especially well during Return To The Praesidium Of Ys. The keyboard playing of Jonny Maudling brings the fantasy to life on Battle Magic as well. Crystal Shards is another instrumental piece. There are obvious comparisons that could be made between this and the music adorning fantasy computer games, but at least it retains artistic credit due to the band’s history. The Dark Liege (for short) is as grandiose as it’s title, while not being lengthy for the sake of it. In fact there’s a level of urgency to it that’s quite pleasing. The momentum gained from The Dark Liege… carries on into When Rides The Scion Of Storms, though mid-paced sections break up the frivolity a little, as does the brooding mid-section before it starts to build in volume and melody. It’s latter half of is very uplifting. Bal-Sagoth injects Blood Slakes The Sand At The Circus Maximus with gladiatorial atmosphere, while the song itself is a bit of an epic at nearly nine-minutes. The immediate battery of Thwarted By The Dark (Blade Of The Vampire Hunter) is a bit of a shock to the senses but nevertheless welcomed. It’s one of the more straightforward songs on ‘Battle Magic’, if you can call Bal-Sagoth straightforward in any way! Closing instrumental And Atlantis Falls… is exactly what’s needed at the end of a challenging album like this. Having given it a full listen, I can fully understand why their fans hold them in such high regard, I’m just not sure that they’re for me. Their status speaks volumes though and for that reason I have a lot of respect for them and what they’re created.